Download on the App Store & Google Play today! Individuals ― of any gender and sexual preference ― can hope to find love with like-minded people. There is no system in place to filter down people you are both physically attracted to and intellectually inspired by. That’s where Sapio comes in. You’ll still have access to photos, filtering tools, and other features you’ve become accustomed to. Unlike most others, you may actually find someone worth having a conversation with. ...the only dating app that puts intelligence at the forefront as an alternative to all those other “superficial” swipe-only dating and hookup apps. A personality to connect with is what makes a relationship great. Start by answering questions to tell your story. Every person has something to say. It's an "about me" section with real meaning. If a fortune teller could accurately tell you one thing about the future, what would you ask them? What activity makes you forget about your problems and the world around you? You're back in kindergarten, and it's time for show and tell. What do you bring? 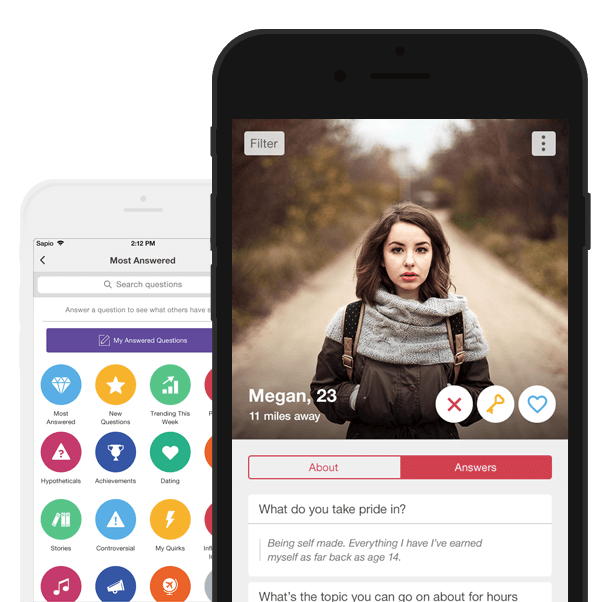 Sapio takes a fresh approach to dating, making interactions fun, not aimless. Sapio's innovative design puts looks and smarts on the same level, giving you a fast and fun way to evaluate potential matches on both brains and looks. The question explorer is an entirely new way to evaluate potential matches. Select questions that matter to you, and sort user's answers to that question by quality, dater criteria, and much more. 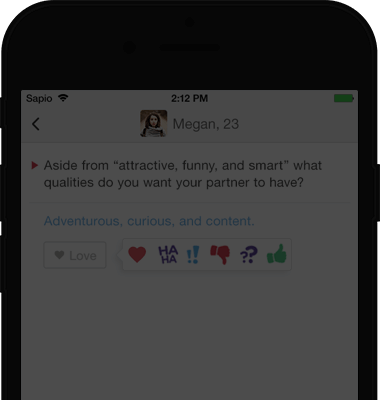 Quickly express interest with our tap-to-like interface, and then go back later and read their Q&A responses when you have more time, or when they have expressed mutual interest. Chat is enabled only when you and a match have both liked each other. No more unwanted messages. Keep organized. Easily keep track of people you like, who like you those who have liked any of your answers to questions. People are picky. Don't waste time; find people that match your needs quickly with advanced filtering. 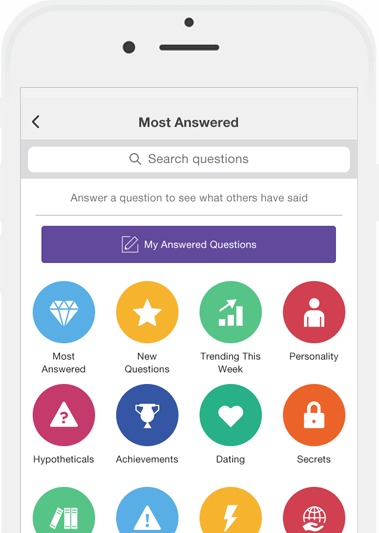 The question explorer lets you discover others through the stories they tell. Select a category, browse through hundreds of questions, and find someone based on their personality, not just their looks.